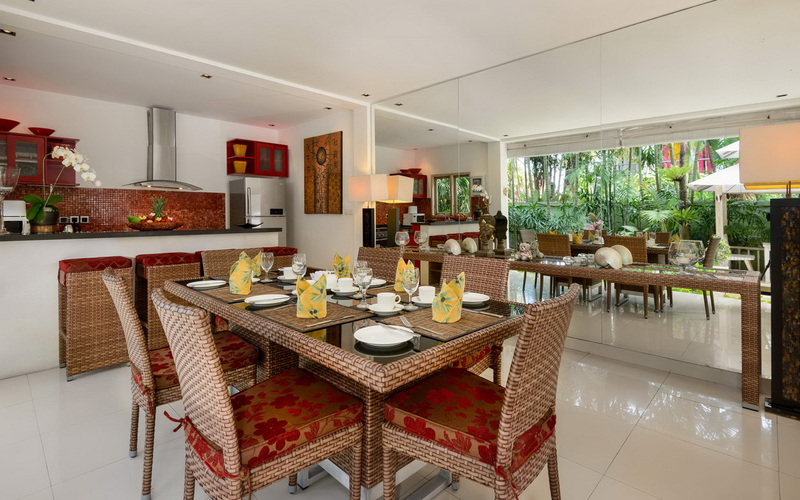 From $ 360 $ 324AUD per night We have direct contracts with most villa owners. We don't add any booking fees. We are 100% transparent with no nasty surprises. 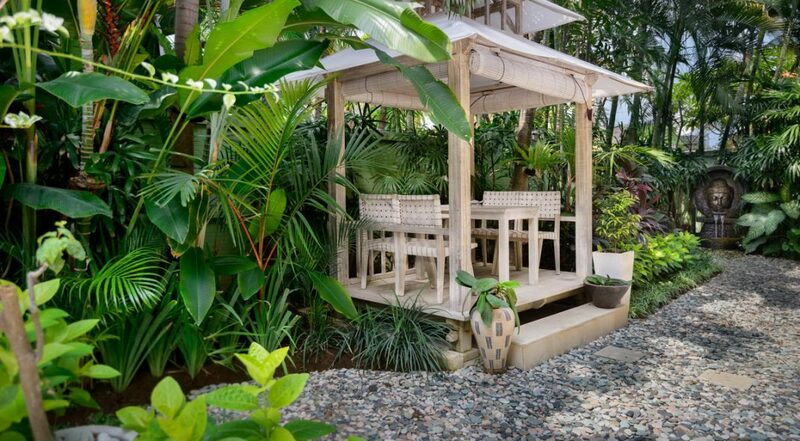 Great outdoor garden area for family breakfasts and dinners. 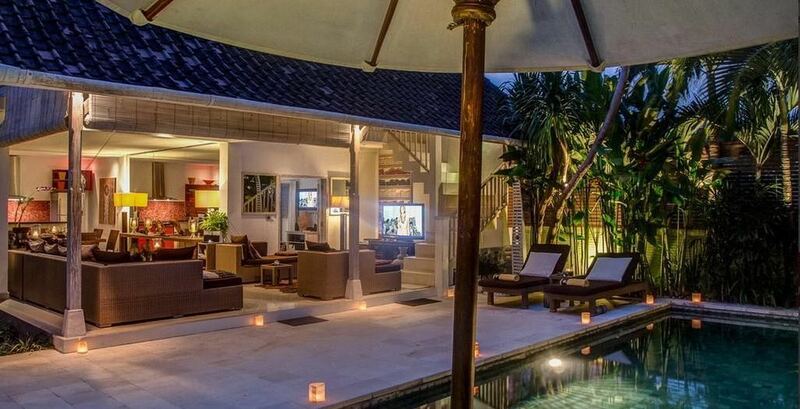 Villa Rama Sita in Seminyak is a fantastic traditional Balinese bungalow that has been completely renovated. 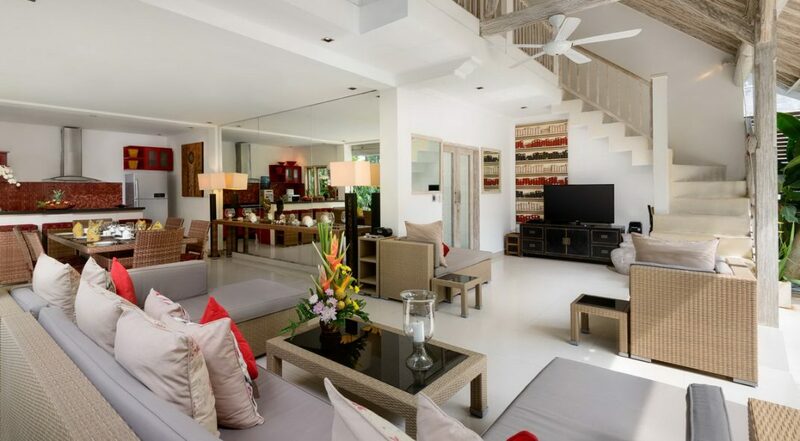 This 3 bedroom Seminyak villa holiday rental accommodates 6 guests. 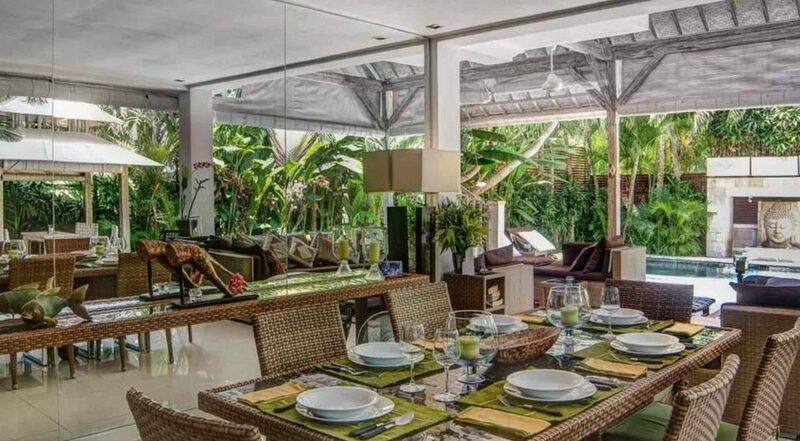 The villas highly sought after absolute prime location, beautiful established tropical gardens, private pool and wonderfully friendly staff make this one of our most popular villas. 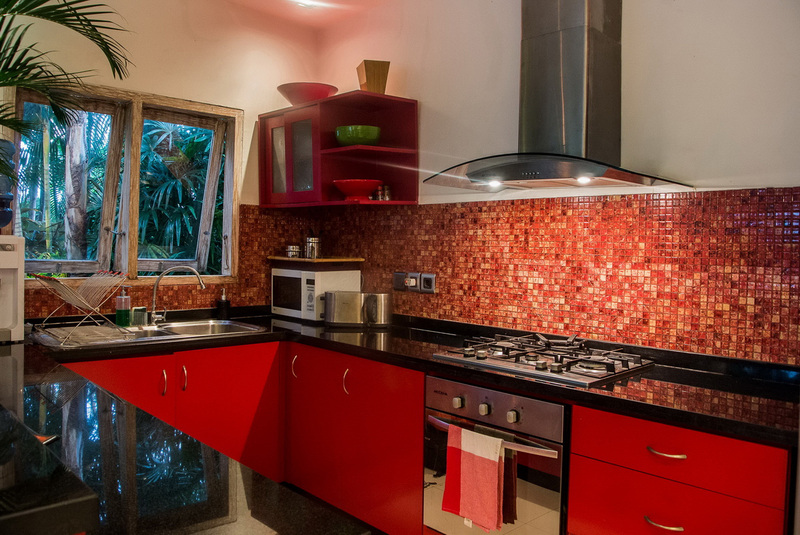 On top of that the villa has a great price point for travellers looking to save on accommodation costs. 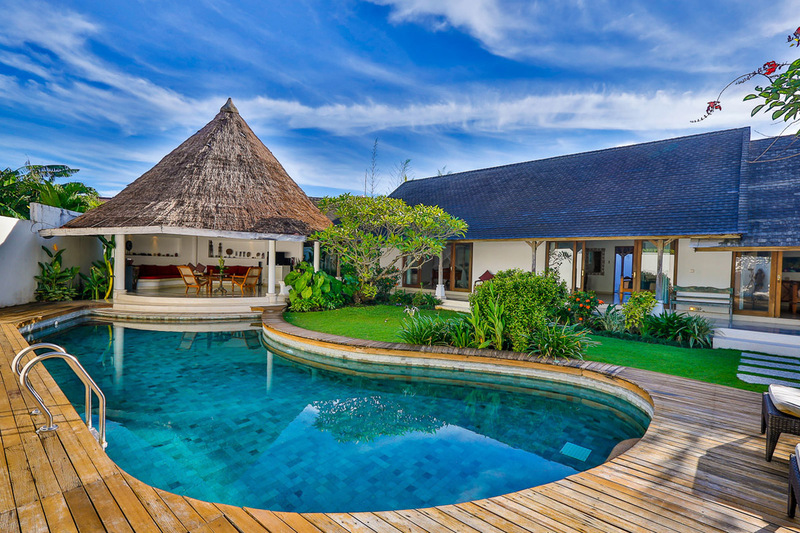 The villas exterior is very traditional with a single slopping roof covering the poolside of the two-storey pavilion. 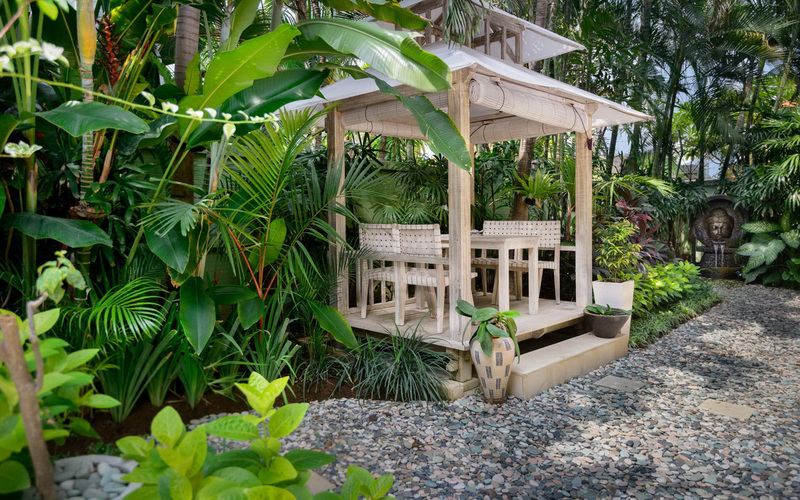 The sparkling natural stone pool with its generous sun deck lined with recliners is certainly a draw card for garden, however the real winner here is the amazing tropical garden. 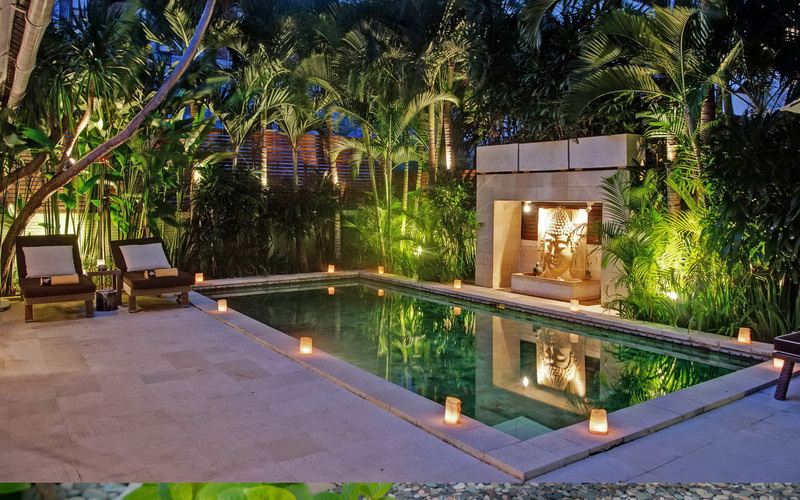 Its full of towering trees tropical palms and plants of all description giving the pool area a very cozy feel with complete privacy. Tucked to one side of the garden is a bale with a table setting perfect for alfresco dining or a game of cards. 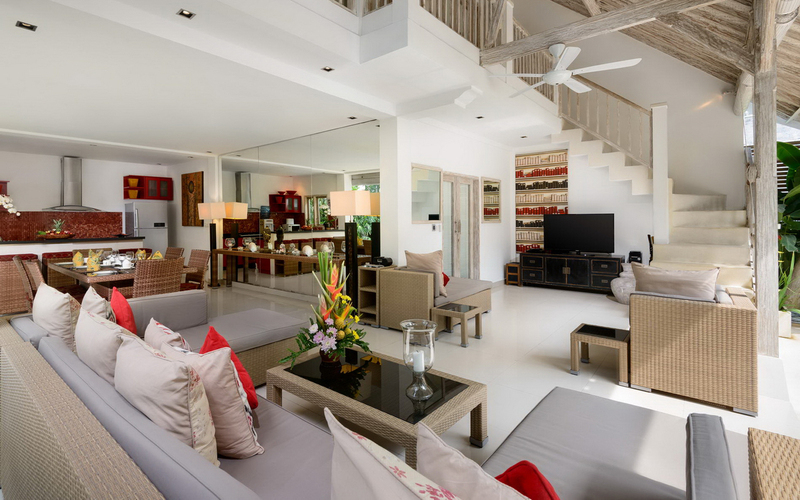 The villas traditional open-air design allows you take in the amazing garden, ceiling fans will keep you cool as you watch TV on the rattan lounge, the glass topped dining table seats 6 guests and the kitchen has black granite bench tops with all the modern appliances you will need to look after any catering needs. 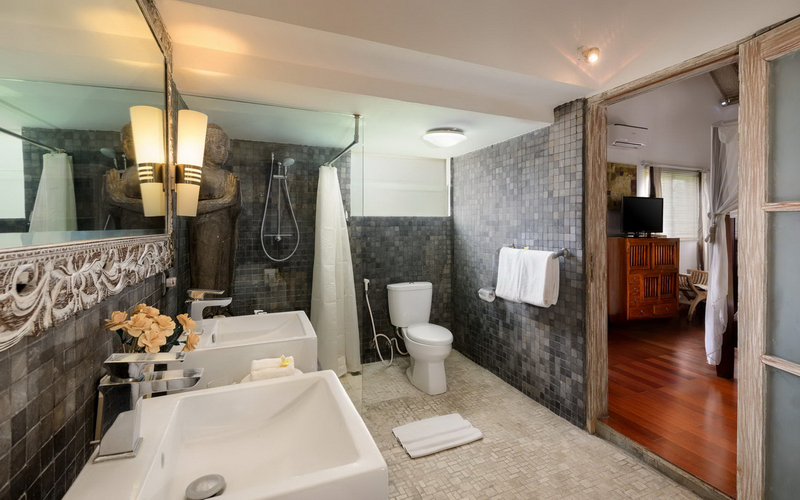 The master suite upstairs features a king size bed, rustic and cozy the room is decorated with an African tribal theme and a sitting area, large flat-screen TV, ceiling fans, air-conditioning and shared ensuite with the upstairs guest room. 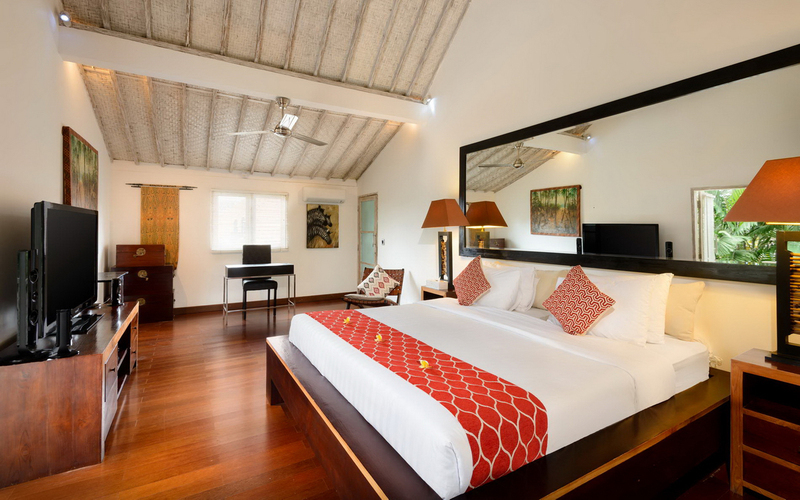 The two guest rooms on each floor are furnished with queen size beds and all the creature comforts of the master suite. 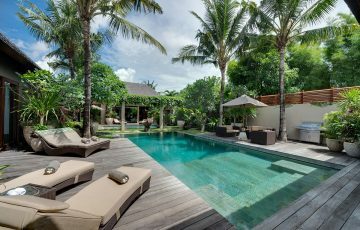 The villa is managed by a friendly team of Balinese staff, the villa manager will oversee the chef, butler, housemaid and night time security staff. 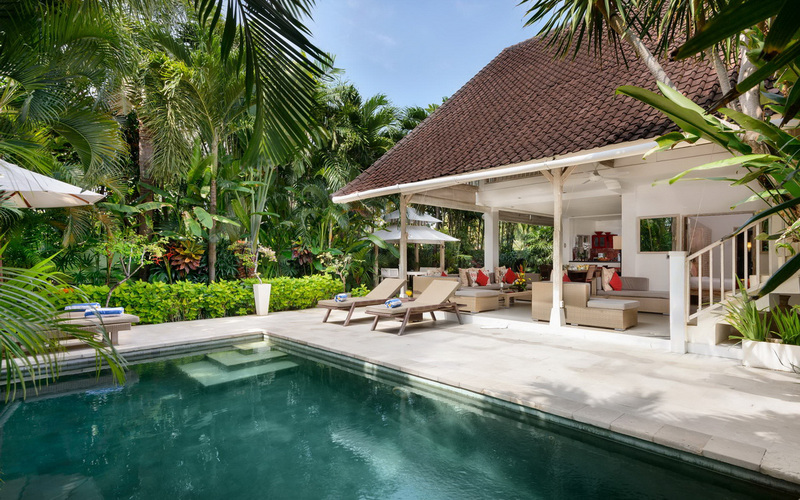 Each day the villa staff will clean the villa and upon request can provide a pool safety fence, babysitter, spa treatments and chauffeur driven transport. 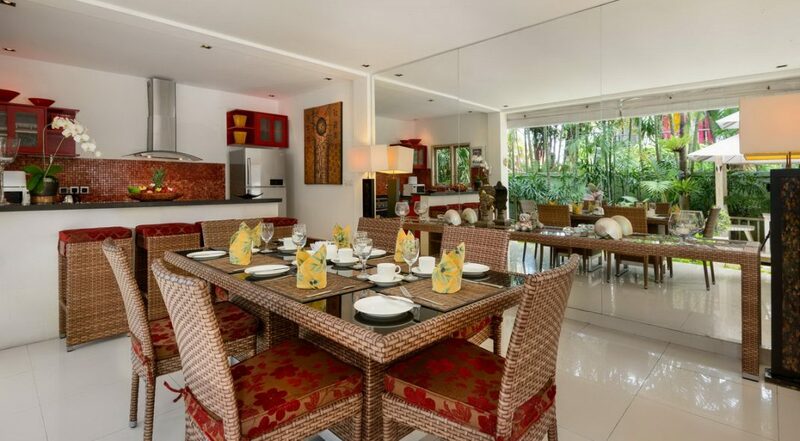 The villa is at the end of a restaurant tucked in behind Sisterfields, while at the beginning of the villa’s lane you are just a few meters from Ultimo restaurant and all that Jalan Oberoi has to offer including the very famous Eat St. Seminyak Square is close with a good supermarket where you can stock up on all your supplies; alcohol, munchies, fruit and veggies, fabulous cafes, restaurants, bars and ATM’s. 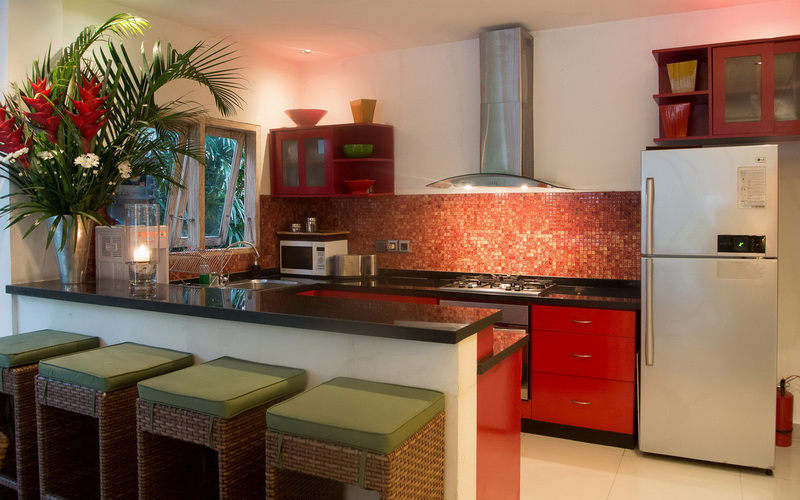 You can easily walk to the beach passed Motel Mexicola to La Luciola and the iconic Ku de ta Beach Club. If your on holiday witht he kids make sure you take them to the Waterbom Park or the Finns Recreation Club (they have waterslides, trampolines & ten pin bowling), which are all an easy taxi ride away. 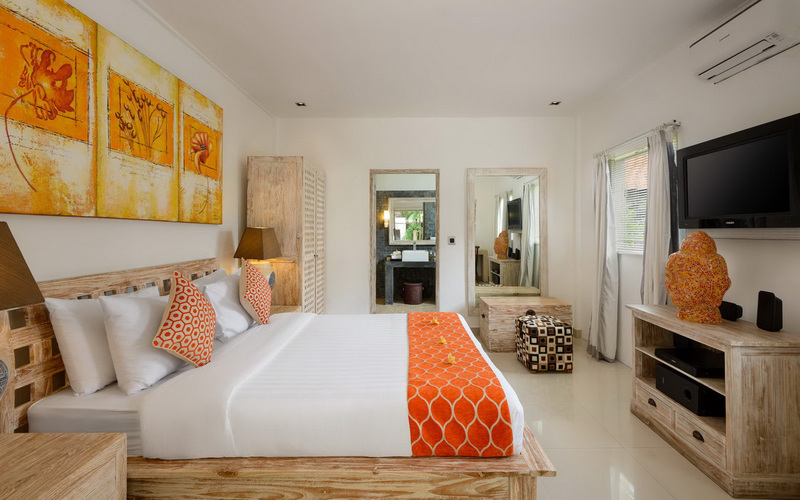 To see other 3 bedroom Bali villas or similar style Seminyak villas close to the beach please browse this website or contact our reservation team. 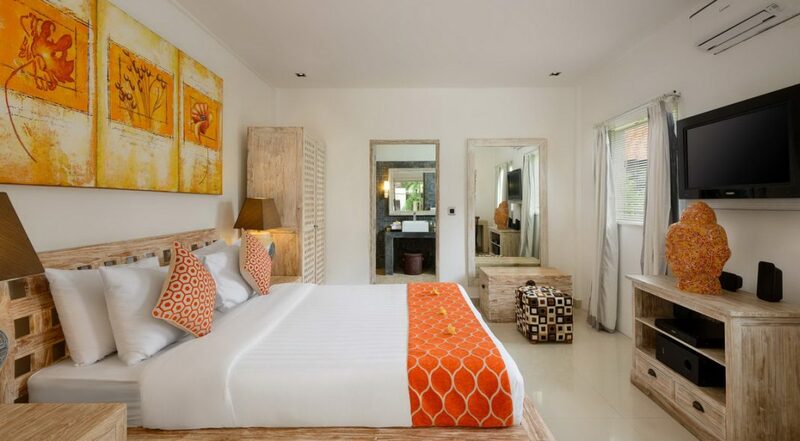 This is a popular Seminyak holiday villa so if your planning a trip to Bali, especially during the Australian school or public holidays please book Villa Rama Sita well in advance. 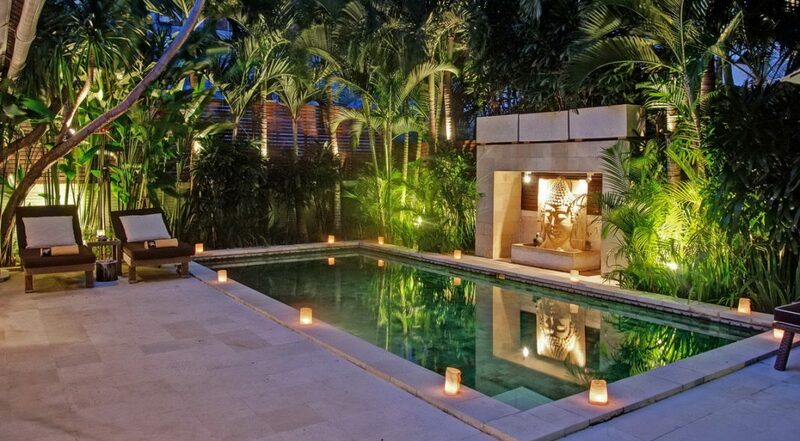 Centrally located and a really great vibe - for the nightly price this was incredible value - loved the pool as well. 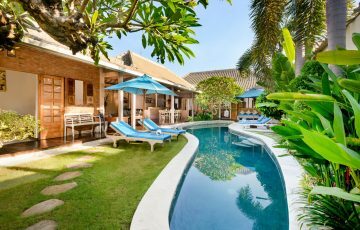 The family had a fantastic 1 week stay here and the kids loved this villa. 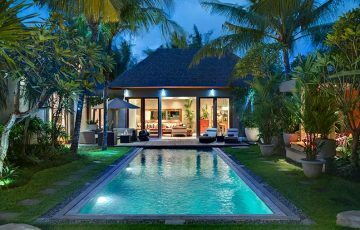 We especially liked the fact that everything was close by - Seminyak Village ( those fab ice creams) and all those great shops. A huge thanks to Putu and Wayan for making this holiday so special with their yummy breakfasts - can't wait to come back here next year. 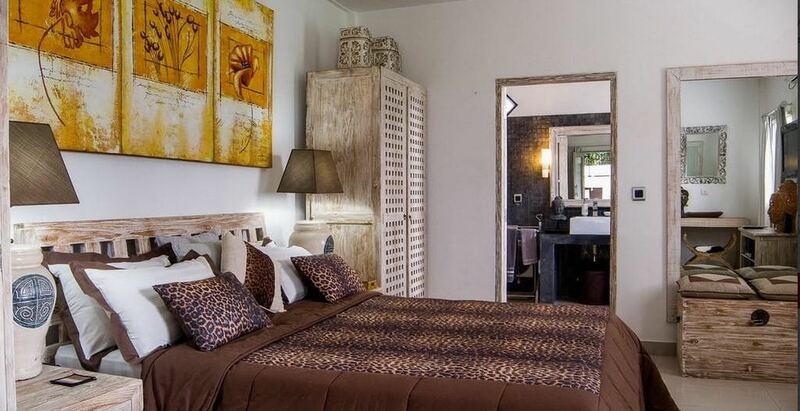 This villa exceeded our expectations and we will certainly be coming back here again. We have tried hotels and stayed at other villas on other islands around Bali but when the team at Bali Villa Escapes told me about this villa and assured me it was family friendly I was willing to give it a try - all I can say is how thankful we are for the week we had here over Easter. 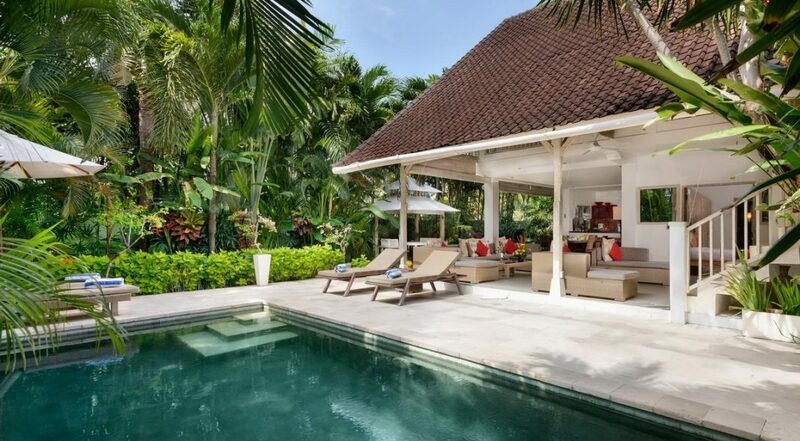 Everything in the villa was spacious and so clean plus I enjoyed the interaction our family had with the local Balinese staff - they are so friendly and we enjoyed every moment with them. Fresh food was cooked whenever we asked for it and nothing was too much of a trouble. We particularly looked forward to the daily breakfasts served to us by the pool - for certain we are coming back again! 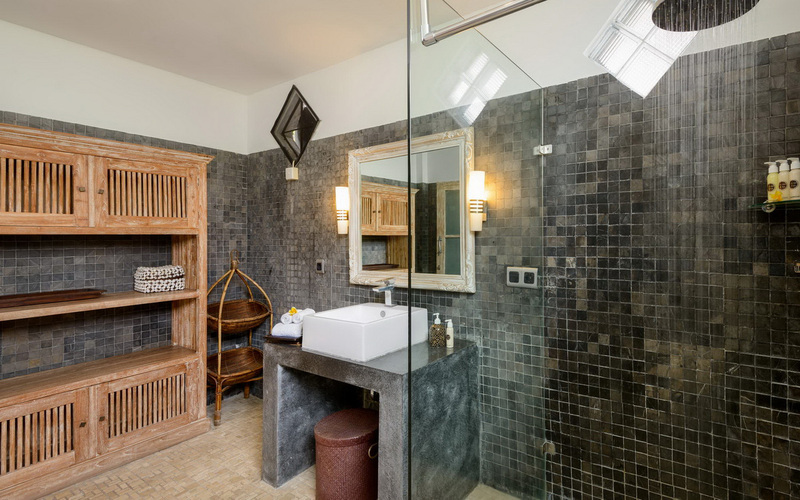 At Villa Rama, everything you can ever think of is provided. My kids loved playing in the pool if they are outdoors or playing the Wii game when indoors. It was the perfect setting for my family. 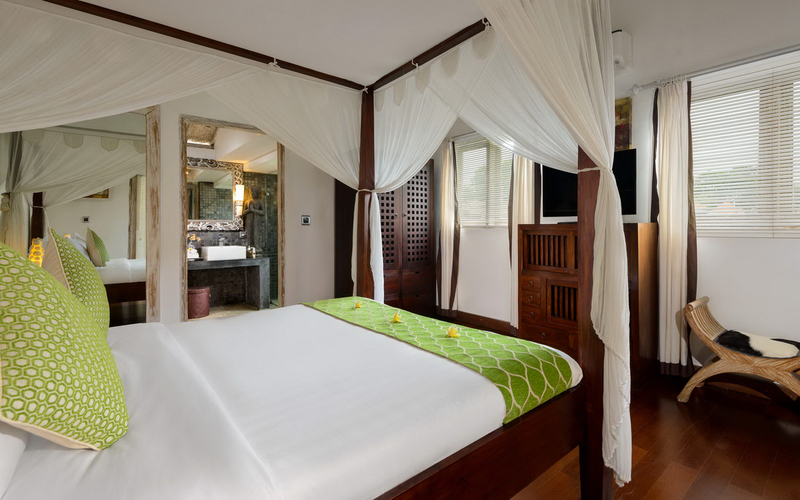 The bedrooms were in separate buildings so we had all the privacy we wanted and the villa was so serene and peaceful, with the best staff you could ever wish for. We had such a great, fun time here. We are looking forward to coming back next school holidays. 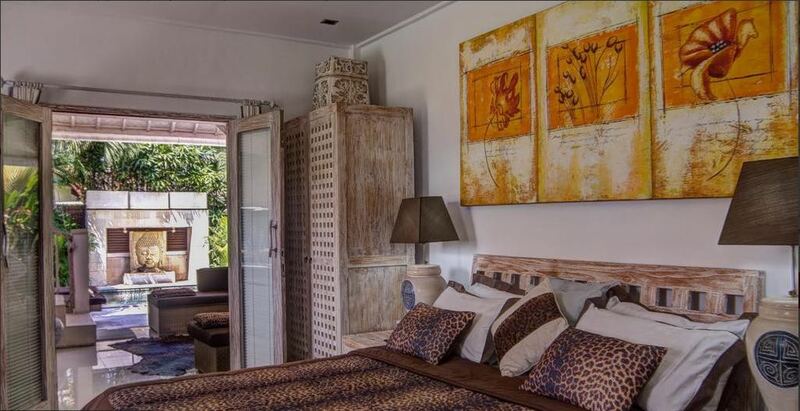 I stayed at Villa Rama with 5 of my best mates and we had a fantastic time. The poolside bar was the perfect as after swimming, we could just hang out there. Since the villa was very close to the town, we had no problems hitting up the clubs, going to the beach or finding a decent place to eat, lots of options. We thank all the staff for being wonderful and making sure we were always comfortable. 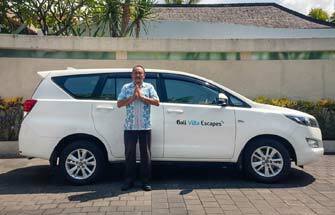 Thanks to the team at Bali Villa Escapes (Yayuk & Ina) for organising this so quickly. Loved it to bits. 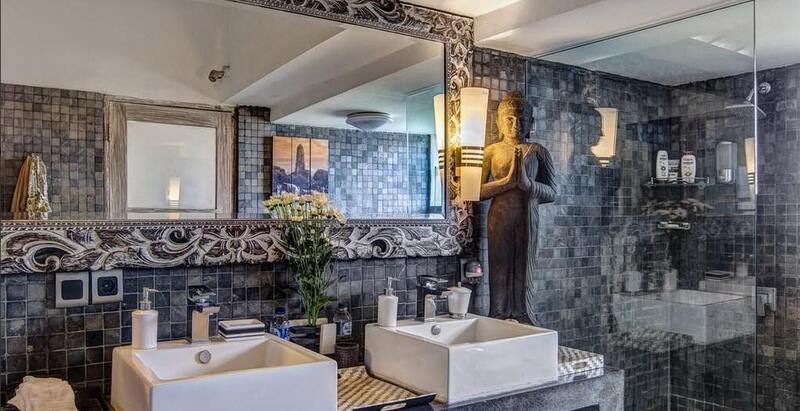 From day 1 this was an exceptional villa. Highly recommended!! Wonderful villa and just what we needed after a long flight from California. 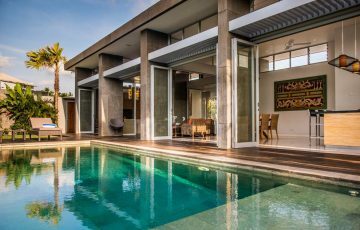 This was our first stop in Bali before we went exploring the island, so we really wanted a private villa where all we wanted to do was relax by the pool. 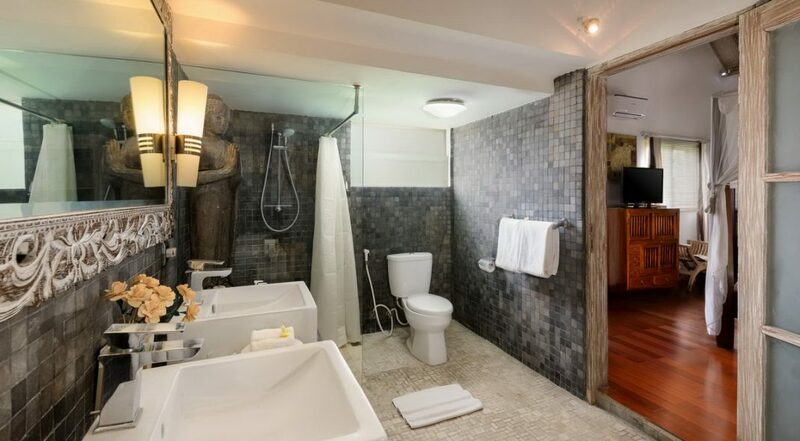 Rama Sita was absolutely great for this; laid back and very peaceful. 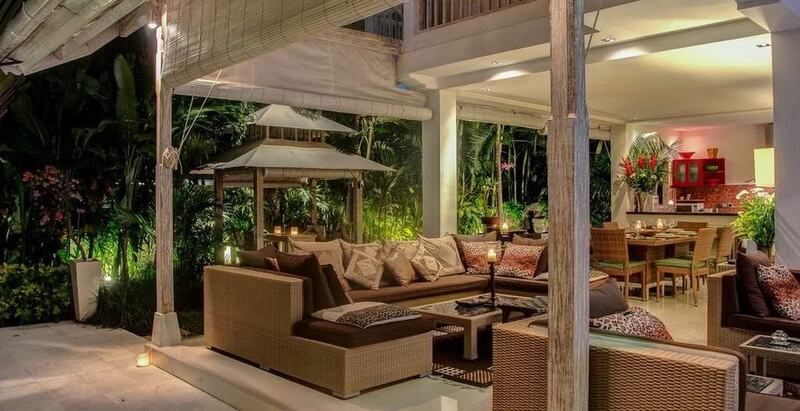 Amazing villa, top value and exactly what we were looking for. Kids cant stop begging us to come back again! 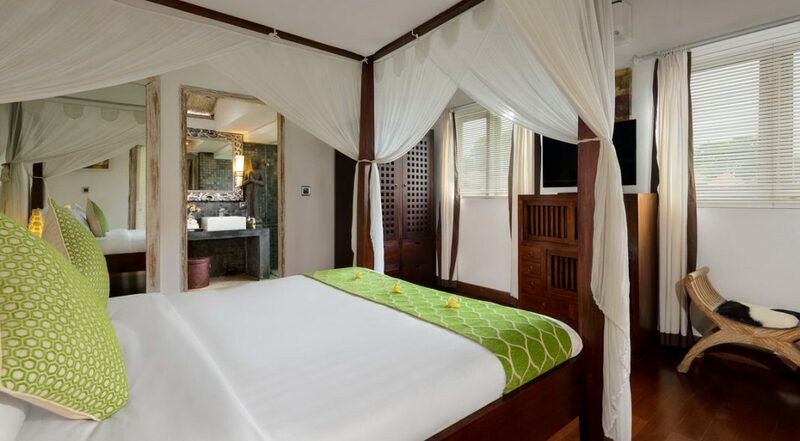 Happy to recommend Rama Sita and Dewi at Bali Villa Escapes for handling this so quickly. Great work guys!